Three resting place Gîtes de France in chalet, near LA PLAGNE and LES ARCS SAVOIE (French Alps). Three resting place "Gîtes de France" in a chalet, near LA PLAGNE and LES ARCS, in the beautiful mountains of SAVOIE (French Alps). Lodge capacity : 11 persons, 6 persons and 4 persons. 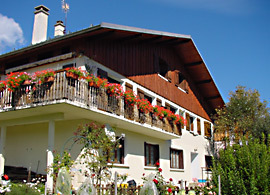 Open all year long for ski, snow-shoes trip, mountain biking, rambling, and local gastronomy. Come and discover 3 comfortables gîtes and the warm welcome of a couple of artists. Michel is sculptor and poet, and Marina is painter artist.